The best thing about making a film from a child’s point of view is that the movie rarely relies upon blatant exposition to get a better understanding of the plot and characters. We the audience have to discover—much like the child later does—what is going on with the adults. The best and most recent example I can think of is from Sean Baker’s wonderful THE FLORIDA PROJECT. In the middle of the film, we are repeatedly shown the young protagonist Moonee taking a bath with the door closed and music playing loudly. When I first saw this, I was confused and had to guess why Baker was showing us this. By the third time, when a strange man walks into the bathroom and asks Moonee’s mother Halley why there’s a kid in the bath, the reason clicked in my head like a light bulb turning on: Halley was prostituting herself from her hotel room, hiding her daughter in the bath with music playing so she couldn’t hear or see anything. 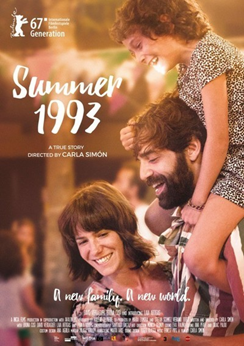 SUMMER 1993 doesn’t share too many similarities with THE FLORIDA PROJECT, but director Carla Simón’s feature debut is also told from a child’s perspective and—for me, anyway—had one of those moments where everything clicked for me, and made me fall in love with the movie. In SUMMER 1993, Frida, a recently orphaned six-year-old, is sent to live with her aunt, uncle, and their young daughter Anna in the Spanish country. After originally living in the city with her parents, the move to the countryside with new family is jarring for Frida and she struggles to adjust to her new life, as well as the recent loss of her mother under circumstances she doesn’t quite understand. Despite some of the cruel things Frida does (particularly towards her younger cousin Anna out of jealousy), Simón cares for her protagonist, as well as the other supporting characters. Never do we have cause to feel anything besides empathy towards Frida, Anna, Uncle Esteve, and Aunt Marga. Even though there is little mention of her dead mother, Frida is revealed to still miss her in some varying degree. Whenever her grandparents from the city visit, she asks them whether her mother’s house has been sold to renters yet; they always kindly respond, “No.” In one cute yet telling scene, Frida poorly applies too much makeup on her face, grabs a feather boa, and acts like a mom towards Anna. She lounges on a chair, fashionably dressed with too much makeup, pretends to smoke a cigarette, and refuses to play with Anna. Frida is quite clearly imitating not Anna’s mother Marga, but her own—in a way, she’s showing us what the first few years of her childhood were like. As with THE FLORIDA PROJECT, SUMMER 1993 looks gorgeous: Simón and her cinematographer paint a picturesque view of the Spanish country. Often, the camera is low and shows Frida’s point-of-view, looking up at adults. Other times, there are intimate close-ups of Frida’s face, only furthering our empathy towards her. 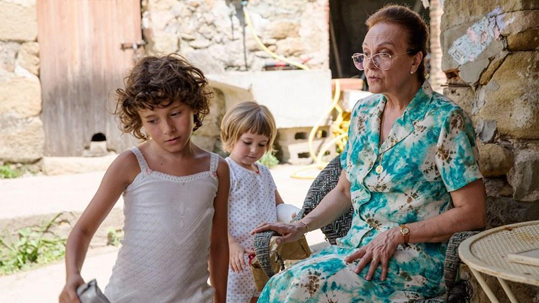 The children who play Frida and Anna (Laia Artigas and Paula Robles, respectively) are phenomenal in their roles. Artigas handles the complexities of her character with grace, many times having to restrain her face that is nevertheless drenched in emotion. One example of this is when Uncle Esteve dries off Anna from a bath playfully and they laugh together at each other. Frida stares at them quietly, her features still, but her eyes filled with longing; she clearly desires that love she herself never truly received from her own parents. Though much of SUMMER 1993 is quite sad, there are also several moments of comedy and genuine happiness within the film. Simón is nothing less than honest in her portrayal of Frida’s summer with her aunt, uncle, and little cousin, which makes her debut so refreshing and compelling. Even though Frida is often mischievous, and Esteve and Marga are often harsh on her as a result, there is no condemnation made against any one character; each member of the family is irrepressibly human. Though the emotional climax and subsequent ending of SUMMER 1993 doesn’t quite have the impact that THE FLORIDA PROJECT does, I can’t help but admire the cathartic release it has and the hope it carries. Simón’s first film reminds us of the pain of losing loved ones that we experience throughout life, yet it also shows us that we can confront and accept our grief—sometimes messily—and be able to move on. It won’t be released in as many theaters as the latest Star Wars or Avengers films, but SUMMER 1993 is arguably an essential summer release, more concise, sweet, and thoughtful than anything else I’ve seen in theaters so far this year.